Here’s Gothyyyyyyyyyyyyyyyyyyyyy! It’s grand to be back! New comics will now be Tuesdays and Saturdays beginning this coming Tuesday. Generally you would find Goth Gal’s latest crazy endeavor here. Today I need to have a chat with you and explain some things that will be happening for the next two weeks or so. For those of you who would like a more thorough story, and have some more time, please read on. My typical day goes something like this, I get up around 8am or so, work my full time job from then until at least til 7pm (normally I work even later, sometimes as late as 1am). On Goth Gal days (Monday, Wednesday and Friday) I take a break (or am lucky enough to leave on time) and proceed to create that day’s Goth Gal adventure. Each comic takes a few hours to make. Sometimes I am in a bad mood and nothing is funny, sometimes I feel terrible and the comic is nearly impossible to create. I always make something unless the technology fails, or I do. Almost always I do manage to create a comic despite these odds and my own epic tiredness. Once the comic is posted everywhere, I may have to go back to work to finish things up, I maybe handle a family emergency or two (I have an ailing relative who needs constant care) , I make sure bills will be paid, I may get to work on marketing my art to sell over at my Etsy shop, I might get to work on current paintings, I might have enough oomph to work on my two novels (yes I am writing two right now), and I (try) to plan what comes next. I also have to handle any emotional crisis I find myself in, any bad health that day, and anything unexpected that comes up. Usually, I finally can go to bed around 3am. On good days I can sleep. On bad days I toss and turn for hours and the sun is long risen before I manage to close my eyes. I then get up and do the whole thing over again. Each day is a struggle to believe I am an artist, writer, creative, or anything else, because I get so little time to spend on it compared to all the time I spend at my full time job trying to make ends meet. Each day is a fight to push myself to create my art despite the tiredness that eats away at my bones and saps my strength. Also, I am currently recovering from some health things that nearly killed me a few times last year. So I am basically bone tired 99% of the time. The comic that takes you moments to read, takes me hours of time, effort and pushing myself to create. I am explaining all of this to you, so that you understand what I am trying to accomplish with my hiatus. I have wanted for some time to get Goth Gal done in advance, but I have not been able to catch a break. The past hiatus was designed for this, but some problems flared up and I wasn’t able to do so. The goal of this hiatus is to enable me the time to make the quality of the content of Goth Gal higher by giving me more time to work on it. 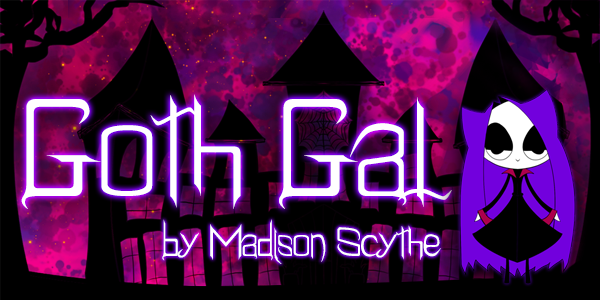 So, I plan to create at least 2 weeks worth of Goth Gal comics in advance, finish the Goth Gal Quarterlies (that I owe some as prizes), and, I may have a surprise for you regarding another Goth Gal thing–we will see how that goes. If you’ve made it this far thank you. I try to be honest about what’s going on with me and why things are happening the way they are. For those of you who have been reading from the beginning, or even just for today, thank you. Without readers, there really is no comic. I love your comments, your reactions and knowing that I am connecting with someone across the vast sea of the internet.